The man in the arena: Connacht's Jack Carty makes his debut for Ireland during the Guinness Six Nations Rugby Championship match between Italy and Ireland at the Stadio Olimpico in Rome, Italy. Maybe not a meteoric rise, but something of a slow and determined slog, Jack Carty, now 26, seems to have been around Connacht Rugby for a long time. Always a talented sportsman, who played soccer, Gaelic football, and rugby, Carty was destined for a career in sport, but after gaining a place in the Connacht sub-academy during his studies for a B Comm at NUIG, it has taken some nine years to realise his full potential and for it to be recognised - the reward being a first cap for Ireland against Italy last Sunday. Criticism from media and fans has also played a unusually important role in his journey to selection on the national squad. Far from being discouraged or allowing self doubts to hinder, Carty has developed a deep inner strength to complement his natural talent, while still guided by parents Ted and Susan. A product of Buccaneers, where he started playing minis, he would join his family to watch Buccaneers seniors - the most memorable a game against Cork Constitution during the height of the All Ireland League when Jim Williams and Ronan O'Gara were first team players. But rugby was not his first love. "I didn't really like the cold. I didn't fancy the muck and cold, so it always took a back seat until I hit my teens," he says. Encouraged by his parents, the Athlone native continued to play both rugby in the morning and then soccer in the afternoon for his club Hodson Bay Celtic, where he developed a "brief fancy" to further his soccer career. An accomplished centre back, he was offered a trial with Southampton, but thought at the time "a transfer embargo" prevented him. "But I know it was my parents who pulled the wool over my eyes. My mum was secretary of the club and went to my dad and said she didn't want anything to do with it. So I found out I got the trials in Southampton, but it was was never spoken about again. So yeah, what could have been." Later he was invited to play with Athlone Town, but by then the rugby bug had really bitten. Although he and Robbie Henshaw would team up as the centre backs to win an All Ireland soccer title for Marist, the two were also coached by Robbie's dad Tony for Buccaneers. "When Tony was our coach, we lost only one game in that time, and that was to Galwegians in the cup in the Sportsground in a game that shouldn't have been played given the weather," he remembers. Rugby was the sport in which Carty "excelled the most". "Soccer was different, tough to break into, and I didn't see a living in Gaelic, although I loved playing it and still miss it. But when I saw the route of rugby, I always looked forward to doing that." It did not stop him captaining Roscommon to a Ted Webb success during which time he and Danny Qualter were also on a summer programme with the Connacht Rugby Academy. "We'd go to training with Roscommon minors on a Tuesday evening and then Connacht on a Thursday. We got to an All Ireland quarter-final, lost to Kerry in Croke Park, and after that it was rugby full time." However, Carty faced his first setback soon after leaving school when missing out on a place into the Connacht Rugby Academy while studying at NUIG. "Unfortunately six lads got them and I was the one who didn't, so I trained with the sub academy. After a few months I thought 'eff this, go and enjoy college life", so I completely stopped going. I was playing with Buccs seniors at the time and playing quite well, when got a call from Nigel Carolan around Christmas offering me an academy contract if I came back training." By the time he was offered a development contract, he had graduated with a B Comm, but with Dan Parks, Matt Jarvis and Miah Nikora in situ in Connacht, he decided to head to the US. "I was convinced by my parents and other people to give it a shot for another year, and that was when Pat Lamb came in. I had been frustrated watching Robbie [Henshaw] and Kieran Marmion getting first team appearances, but luckily enough I put my head down and got my first cap when Gavin Duffy came off and Jarvis went to 15, with me slotting into outhalf. That was in 2012, and he would have to wait another year and a half for a first start. As the No 4 in the squad, behind Dan Parks, Craig Ronaldson and Miah Nikora, he was given the nod against Leinster in the Sportsground, then a victory over Zebre, and a bench place against Saracens. "I ended up starting against Leinster after my worst training session - I couldn't pass at all and I'm sure the lads around me were wondering how the heck I was starting, but I actually played quite well in that match - it was Darragh Leader's first match too, and we were playing against Brian O'Driscoll, Gordon Darcy and Ian Madigan - we lost by about eight points." By the following season Parks had departed, Ronaldson had been converted to centre, and Nikora headed to Italy. It was not the normal route to jump from No 4 to No 1 in the province, and it was a tough initiation. "There was nobody for me to learn from, I learned from the coaches. The game was very structured with Pat so it was easy, you had a job to do, so it was very much within a framework - 'this is what you do when you are here, and here', so it suited me coming into a new environment. You don't want all the pressure of choosing options, and although my consistency was up and down, I found the framework helped me a bit. Enter AJ MacGinty in 2015, and the water slide accident in Dubai which necessitated the removal of Carty's spleen, ultimately being forced to travel as the 24th man for the PRO12 final. But Carty is nothing if not resilient, a self-improver, and a thoroughly decent bloke. When facing criticism, he turned to inspiration from Teddy Roosevelt's The Man in the Arena speech - about people who always criticise, but are never the ones in the arena. "I used it a good bit at times like that, and still use it today when people are questioning whether I should be in an Irish squad. It is quite grounding because no one knows what it is like to direct a team around the pitch unless they have done it themselves. "I have learned from other people who were playing, and other sports athletes, and my mental side of the game, especially this year and the latter part of last year, is so much stronger." Every week Carty repeats certain processes, including visualisation, and writing down his wishes. 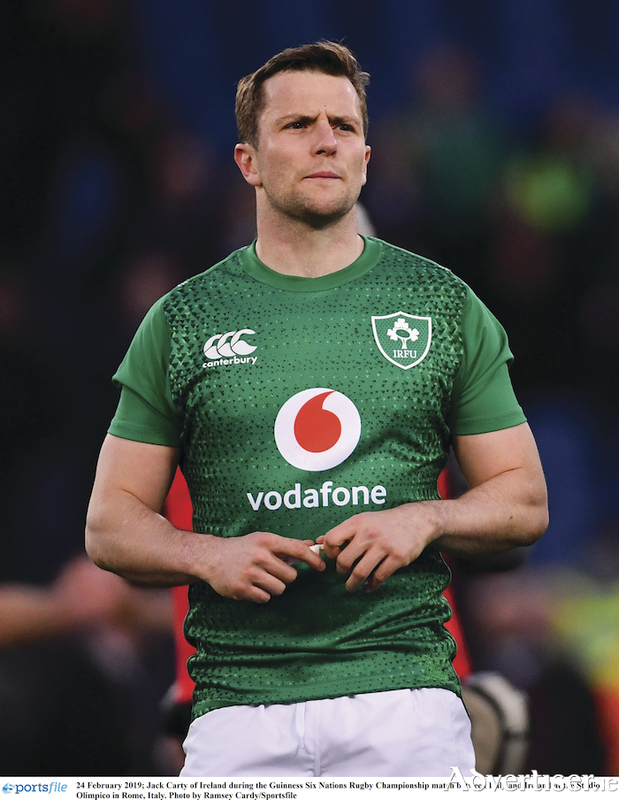 "For the Irish squad, I would have written down on a sheet of paper, and I don't know how many times, 'I will play for Ireland', and even if I didn't play for Ireland, it may not have mattered, but the fact that I did keep writing it down is like the law of attraction, it will eventually come true." A fierce believer in listening to motivational podcastw - such as Joe Rogan, Tim Ferriss, Inky Johnson, former college football player, and Kobe Bryant, former American basketball professional - he "wrecked the head for months" of Connacht's head analyst Simon Kavanagh to make a video for him - "all of my best bits, and clips of all those different things from Kobe Bryant, Inky Johnson, and me kicking. I watch that before I go onto the pitch, it gives me confidence in the work I have done that I can go into a match completely confident of my ability." And learning from Ferriss, Carty sets small goals. "You cannot get from A to Z in one go, but in small incremental steps, so this year my first goal was to get into the Irish camp and I did that a month ago. The next one to dislodge the person in third place and I did that, and now I am reassessing to hopefully push up into second - the fellas who are there and below me are playing well, so it's just about trying to improve every day." Deservedly, it is coming to fruition for Carty, who continues to flourish under Connacht's head coach Andy Friend. Never waivering, he continues to set new goals, writes them down, and continues to improve, while also taking inspiration from others, most importantly his cousin Brian Carty who passed away last year. "I looked up to him. He would have given me a lot of advice, and when I got picked, I know he would have been delighted. He was 28 and died after a long battle with cancer when we were away to the Cheetahs. He would have been the fella to say 'play the game' so I did, but I was able to fly home myself in time for the funeral. So I played the game, came back for his funeral, and I know he would be more delighted than I am with my selection on the Irish squad."